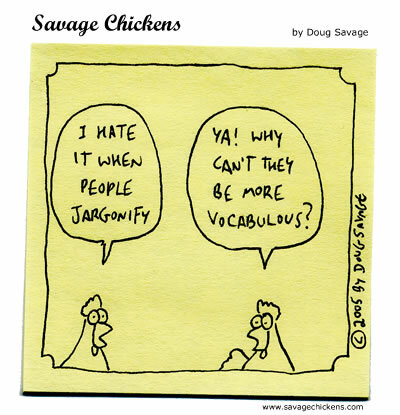 Jargon can be infuriating. I’ve seen it used to exclude people by limiting the conversation to the few people in the room au fait with the terms. This is particularly undesirable at decision-making discussions. On the other hand, I’ve seen people exclude themselves from conversations by refusing to inquire into the meaning of words. I sometimes ungraciously refer to them as the “ban the jargon” brigade. We could however, choose to be curious, to see new words as an invitation, not just to learn, but to co-create new meaning. According to Confucius, “The beginning of wisdom is to call things by their proper name.” Often times, new insights do come from recognising and naming a new phenomena or idea. However, for these insights to have any meaning, they have to be collectively owned. I believe that the most effective antibodies for the jargon virus are questions. Next time when you are in a meeting where jargon is being thrown like confetti, try curiosity rather than contempt. In my experience, when you say, I’ve never heard of that term before, would you mind explaining what you mean by that, someone will inevitably come up to you afterwards to say, “I’m glad you asked that question, I didn’t know what it meant either”. Fighting fire with fire produces more fire, so try not to fight truth claims with truth claims. Gianfranco Cecchin describes curiosity as the ability to suspend our own biases and ways of thinking, in order to facilitate the hearing of multiple perspectives and opinions. One way of doing this is to encourage people to generate hypotheses (hunches, dilemmas, possible explanations) rather than making singular truth statements. As a rule, offering people choices tend to lead to collaboration, while making propositions have the effect of closing down conversations. Jargon defines an in-group from all the other out-groups. It also distinguishes the cogniscenti from the non cerebral. It may also serve to exclude non followers as being another language group so being able to carry on a conversation without being understood by onlookers, or heareers.. If I ask, “do tutti pooker?” I may be speaking to another person of this language and ethnic group as a way of opening up for a very private conversation..
Jargon may be technical as the language of a trade, The old printers who used type had a very rich technical jargon which served all these purposes or was just an aural shorthand to pass on information and instructions. to other m,embers of the trade guild. ‘Andsome’ or with the aicth, ‘hansdome’ as in ‘handsomely’ does not mean good looking but ‘gently’ or more slowly. Sailors would also know what I meant if I said “avast there’ or ‘vast there’, hardly sounding the ‘a’. Sailors have a very rich jargon and one instantly knows when another has saiied the seven seas. We usually refer to the floor as the ‘deck’ and use other terms like ‘half seas over’ as describing someone who is drunk, or ‘off watch’ as ‘with nothing to do’.